When MLB went about selecting its All Century Team, The Sporting News (long time based in St. Louis) selected an all time St. Louis Cardinals team--one that would give the all time MLB team a good contest. 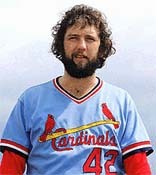 Master of the split finger fastball, Sutter lead the National League in saves three times (with a high of 45 in 1984). He recorded the final out in the 1982 World Series by striking out Milwaukee Brewers' Gordon Thomas.